Poured to a Brouwerij'TJ tumbler glass. A: The body is pitch black with a beige good forming head. Some good retention for a BA beer. S: The aroma is a strong in the roastiness but lost some sweet characteristics. It's also a bit forward on the bourbon but it's subtle. T: The taste still shows a bit of complexity, showing the roastiness of the malts, the adjuncts of vanilla and cocoa but dying almost - showing that this beer is really not cool to be cellared, it appears I've stretched too far, but in the end, a surprising tartness and acidic profile shows up. For a BA beer, it's not like it's something I wouldn't expect but for an Imperial Stout, I was expecting to find a more clean palate towards the end. Weirdly, no bourbon. M: The body is medium to medium low. Carbonation is good. Alcohol content is high and pervasive. 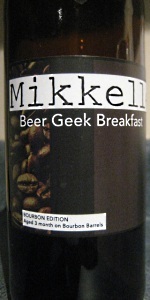 O: The BA series of Beer Geek Breakfast are really something not worthy of the price. Glad to taste them but seriously, the plain version still beats these. Good black pour, but there is something not quite liquid in the beer. Anyways, black in the middle, brown, dark toward the edge. Tan head, thin, 1/5". Hits the older coffee and mild bourbon notes. Taste is interesting, less bitter, less coffee, less malt almost, the barrel aging thinned this out a little, seemed like a lighter batch abv wise too. A very expensive beer, relative to what you get. Doesn't do anything bad, but at this price, you have to do some stuff very well. Sure it has some complexities if you look for them, chocolate malt, licorice, vanilla. But I dunno, it gets tough to repeat purchase something that is twice as expensive as other beers that are actually substantially better than this. Barrel aged coffee beers are all over the place. A: thin looking but deep black with a solid mocha head. Slight retention, but some foamy wisps remain atop the beer throughout. S: decent wood and vanilla, but coffee relatively muted and most notes are fairly mild. T: a bit mild, light vanilla, some coffee dryness in the finish. M: thin with medium low carbonation. O: fine, but not out of this world. Not sure what happened with this bottle, but it was hugely disappointing. Flavors were off, to the point that I'm wondering if it was infected? Would try it again, just because there's no way this was what was intended.